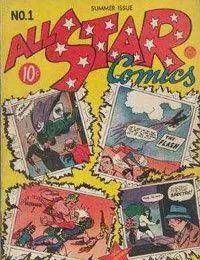 In true egalitarian fashion, each source title in All Star Comics was represented by exactly two features, and in an editors letter readers were asked to mail a coupon indicating which three characters they would like to see join the line up and which three they would like to get rid of. The revolving door suggested by this content by democracy setup disnt entirely take hold as the comic changed its focus with issue 3 (Winter 1940) by introducing the Justice Society of America. Consequently the Bill Bronson, Ultra-Man and Red, White and Blue features - the only ones with protagonists not represented in the JSA - were quickly eclipsed in popularity.